What it really means to submit to God. 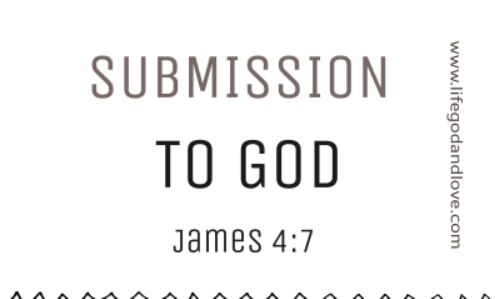 The Word submit means to yield to the control of another. It also means to willingly let go of your own thoughts, ideas, and ways for another person. We all struggle with this area of submission, whether it be to our parents, spouse, authority and so forth. As a woman, looking at submission in marriage seems hard to do. You have to relinquish the right to do whatever you feel is best to do and follow the headship of your husband. You can present your opinion, but at the end of the day it’s what your husband says that matters most. In the same way, we can relate this with God and our relationship with Him. But when it comes to God how willing are we to be submissive? Do we find it easy to obey what He says in His Word or we’re bent on doing things our own way? Do we submit a particular area of our life and tell Him ‘hands off’ on another area? In truth, we can’t think of having a wonderful relationship with God if we aren’t willing to submit to Him. Even more so, we can’t overcome certain trials in life if we arent submitting to Him. We all face different trials and temptations in life and it’s hard to overcome them on our own. I can say this ’cause I’ve been there. Trying to overcome anger or the temptation to make out with a boyfriend. At a point in time I thought I could do it on my own. I actually thought it was by own strength and capabilities to overcome them until I literally fell and I wondered why it happened since I was such a ‘good girl’. Obviously, God was teaching me something as I realized I couldn’t have victory over sin/temptation on my own. When you have a particular temptation or problem you are facing, submit to God. Submitting to God means obeying what He tells you to do at that time of whatever temptation you are facing. What He tells you to do at that time, (once you are in tune with the Spirit and you’re willing to listen), helps you overcome what the devil is presenting to you. It helps you resist the devil and he would surely flee from you. But when we refuse to obey God at that moment of temptation, we risk falling into the trap of the enemy and attracting him to wreck more havoc in our lives. Hence, we cannot resist the devil as we should. I believe submitting to God gives us the power to resist the devil. We have God’s backing to fight against the enemy and be victorious. Submission is easier said than done on a normal day, but it can be done. We learn submission from adhering to God and His Word. He gives us grace to obey. You can’t submit to God if you haven’t given your life to Christ and accepted Him as your Lord and personal saviour. Father, I come to You and confess all of my sins. I surrender my life to You. Please forgive me… wash me clean with Your blood. I accept You as my Lord and Personal Savior. If you just took the above prayer please email me at topeogunyinka@gmail.com so I can tell you what’s next. I’m so happy to announce that LGL is clocking 1 on the 1st of August, 2016! It’s been a wonderful year, though it had its ups and downs. God has indeed been faithful! ? To mark the anniversary we would be running testimonials on how the website has been of benefit to you. You could send this to my email topeogunyinka@gmail.com , and it would be published on the website. Also, there would be giveaways … more details would be passed across soon. Separated would start on the 1st of August . . .
back to the message, submission is hard, but it’s a must and it’s for our own good at the end of it. I pray for more grace to be submissive. love you? Yaay,LGL will never die… Hurray!!!!. Hi Oreoluwa! Amen o! Thank God for His faithfulness ?. Amen and amen for grace to be more submissive.